Dig in! Dig in! 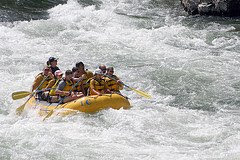 Suddenly the waters turned into a whirlpool and the six of us thrust our paddles into the water feeling our weakness against the water’s strength. Nevertheless, our rafting guide continued to yell, Dig in! We listened. Digging in was what had to be done in order to get through to the other side. and the Holy Spirit’s guidance.